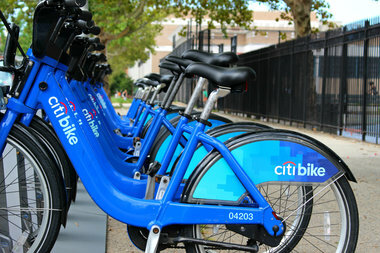 The stations will be installed starting Sept. 12, bringing 2,000 bikes to 140 new Citi Bike docks. NEW YORK CITY — Citi Bike will unveil new docking stations in Astoria, Long Island City, Harlem, Crown Heights and Prospect Heights starting next week, officials announced Tuesday. The expansion will consist of 140 new stations containing 2,000 bikes in those neighborhoods, fulfilling the city's earlier pledge to more than double the size of the bike-share network by the end of this year. The stations will be installed in areas that have yet to benefit from the service, with 59 coming to Astoria, 27 planned for Crown Heights and Prospect Heights, and dozens set to open in Harlem between 110th and 130th streets. Long Island City — the first Queens neighborhood that Citi Bike launched in in 2015 — will also get seven additional stations under the expansion. Construction of the new stations will begin on Sept. 12, starting first in Manhattan, then in Queens and Brooklyn, a Department of Transportation spokesman said. Stations will be activated the same day they're installed, with all 140 expected to come online by the end of 2017, he added. The DOT will be monitoring the sites as they become operational and will make adjustments if needed, the spokesman said. "More than just adding neighborhoods to the bike share network, Citi Bike is also bringing more bikes and stations to already established neighborhoods," DOT Commissioner Polly Trottenberg said in a statement. After this latest rollout, Citi Bike will cover more than 30 square miles in parts of Manhattan, Brooklyn and Queens, officials said. There are no concrete plans yet to bring the service to additional areas, though the DOT is "actively exploring all available options for doing so," according to a press release. You can find a map of areas currently serviced by the program here. A Citi Bike membership costs $163 annually or $14.95 monthly, and NYCHA residents qualify for a discounted membership of $5 a month.